Wildebeest (plural, wildebeest or wildebeests), also called gnu, is the common name for an antelope of the genus Connochaetes, characterized in both sexes by horns that are smooth and initially curving downward or outward, elevated shoulders, and thin legs. Gnus belong to the family Bovidae, which includes cattle, goats, and other even-toed horned ungulates. 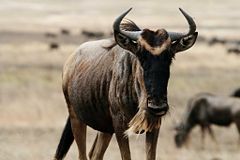 Connochaetes includes only two extant species, both native to Africa: The black wildebeest, or white-tailed gnu (C. gnou), and the blue wildebeest, or brindled gnu (C. taurinus). The blue wildebeest, which sometimes can be found in huge herds, particularly those migrating in the Serengeti of Tanzania, are key components of food chains in their ecosystems. Exemplifying bi-level functionality, they advance their own survival and reproduction through grazing on grass, while they also provide food for lions, crocodiles, and other large predators. Humans have almost completely exterminated natural populations of the black wildebeest, killing them as a source of food and hides and further motivated by the desire to reserve grazing lands for cattle. Existing populations of the black wildebeest are reintroductions from captive animals. Additionally, for humans, the large free roaming-herds of the blue wildebeest provide a favorite ecotourism sight, adding to the wonder of nature. Wildebeest are antelopes, which are a diverse group of typically hollow-horned and swift bovids native to Africa and Asia. Antelope species do not form a taxonomic group but are spread throughout the subfamilies of the Bovidae family (bovids) of the order Artiodactyla (even-toed ungulates). As members of the Artiodactyla order, wildebeest walk on the third and fourth toes of each foot, which are covered and protected by hoofs—specialized claws. Standing on the toes has the effect of lengthening the legs, which gives them greater quickness and speed in running and jumping and lets them hold their heads higher above the ground to better watch out for predators (Huffman 2007). White bearded wildebeest, Ngorongoro Crater, Tanzania. As members of the Bovidae family, wildebeest are ruminants, which means that they have a four-chambered stomach that allows them to digest foods—notably grasses and the leaves of trees and bushes—that are too low in available nutriments for many other animals. No animal is able to directly digest cellulose, the material of plant cell walls; ruminants rely on a symbiotic relationship with bacteria and other microorganisms in their first stomach, called the rumen, to break down cellulose by fermentation. Wildebeest typically are further classified as members of the subfamily Hippotraginae (grazing antelopes) and tribe Alcelaphini (Taylor 2004). The Alcelapini also includes the hartebeests and the sassabies. Wildebeest have a medium to large body, of somewhat stocky build, a long head, elevated shoulders, thin legs, and smooth, initially downward or outward curving horns, found in both sexes (Taylor 2004). They also have a very long, tufted tail, a beard, and a mane (Taylor 2004). Wildebeest grow to 3 ft 9 in–4 ft 7 in (1.15–1.4 meters) at the shoulder and weigh 330–550 pounds (150–250 kilograms). The black wildebeest occurs only in South Africa, but the blue wildebeest occurs from South Africa to Kenya and Angola (Taylor 2004) inhabiting grasslands and open woodlands, especially the Serengeti. Wildebeest can live more than 20 years. Like almost all bovids, the wildebeest are social animals that live in groups, called herds. The principal food source of wildebeests is grasses. While the blue wildebeest may be sedentary, nomadic, or migratory, depending on local conditions of rain and green grass, the seasonal nature of the African grasslands in the Serengeti of Tanzania forces spectacular and regular migrations of herds in that area (Taylor 2004). The main migration is in May, when around 1.5 million animals move from the plains to the woods; they return in November as summer rains water the plains. Wildebeest generally graze on grass and blue wildebeest prefer to graze areas of short grass; the black wildebeest also will browse on plants during the winter (Taylor 2004). Since the diets of wildebeest and cattle are broadly similar, they tend to want to graze the same land. As a result, expansion of livestock herds has inevitably led to a reduction in the wildebeest populations (Taylor 2004). The name wildebeest derives from the Dutch and Afrikaans words wild and beest, which together mean "wild animal;" additionally, "beest" in Afrikaans means "cattle" (or "steer"). Although the name is derived from the Dutch language, the name wildebeest does not officially exist in the Dutch language. The Dutch name for wildebeest is gnoe (where the Dutch "g" is pronounced [x], as in loch). Afrikaners (Afrikaans-speaking South Africans) may have started using the name wildebeest for the animal as they had no other name for it when it was first encountered. 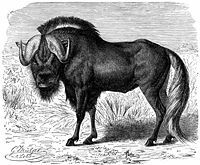 "Gnu" is from a Khoikhoi language (which pronounced the [g]), likely an imitation of the grunting noise that a wildebeest makes. The pronunciation of [gnuː] was popularized in English by the comic song "The Gnu" by Flanders and Swann, in which all words starting with n have a g prepended: "I'm a g-nu, I'm a g-nu, the g-nicest work of g-nature in the zoo." 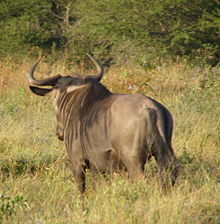 The black wildebeest or white-tailed gnu (Connochaetes gnou) is found mainly in east-central South Africa, particularly in eastern northern Cape and Free State (Taylor 2004). The natural populations of this species, endemic to the southern region of Africa, have been almost completely exterminated, but the species has been reintroduced widely, both in private areas and nature reserves throughout most of Lesotho, Swaziland, South Africa, Namibia, and Kenya. The primal herds were exterminated, being seen as pests, with the secondary advantage of using the hides and meat. The tails also were valued as fly swats (Taylor 2004). Thus, this animal exists primarily in herds derived from captive specimens; there do not appear to remain any animals that are truly wild (Taylor 2004). They may have had extensive migrations or movements at one time, but are now restricted by fencing (Taylor 2004). The black wildebeest is characterized by a tuft of stiff hairs on the face. It grows to 5.6 to 7.3 feet (1.7 to 2.2 meters) in body length, 3 to 4 feet (.9 to 1.2 meters) in shoulder height, and with a 2.6 to 3.3 foot (.8 to 1 meter) tail, with a weight of 242 to 396 pounds (110 to 180 kilograms) (Taylor 2004). The blue wildebeest or brindled gnu (Connochaetes taurinus), also known as the blue and white-bearded wildebeest, is found in open and brush-covered savanna in south and east Africa. It derives its common name from a conspicuous silvery blue sheen (Estes 1991) to the short-haired hide, differentiating this species from the plainer black genus member, black wildebeest. In reality, the adult's hue varies from a deep slate or bluish gray all the way to light gray or even grayish-brown. The dorsal coat and flanks are slightly lighter in hue than the ventral hide and underparts, and there are dark brown vertical bands of slightly longer hair that mark the neck and forequarters, which from a distance lend a perception of skin wrinkling. Sexual dichromism is exhibited by the males displaying decidedly darker coloration than the females. Young blue wildebeest are born tawny brown, and begin to take on their adult coloration at age nine weeks. 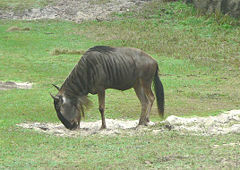 Blue wildebeest have a slight hump above the shoulders, a slight slope toward the rear, a black mane, and a flowing beard in both sexes (Taylor 2004). The manes of both sexes appear long, stiff, thick, and jet black, a color assumed by the tail and face as well. It has a beefy muscular front-heavy appearance with a distinctive robust muzzle; it strides with relatively slender legs. Head and body length range from 67 to 95 inches (1.7 to 2.4 meters), with a shoulder height of 45 to 57 inches (1.15 to 1.45 meters) and a weight of 308 to 640 pounds (140 to 290 kilograms)(Taylor 2004). The male is larger than the female. 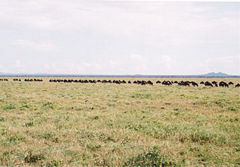 The wildebeest migration in the Serengeti. Probably the most conspicuous feature of the blue wildebeest are the large horns shaped like parentheses, extending outward to the side and then curving up and inward. In the male, the horns can attain a total span of almost 90 centimeters (35 inches), while the female's horn width is about half the size of the male. These cow-like horns of both sexes are somewhat broad at the base and are without ridges. However, as further sexual dimorphism, the male horns have a boss-like structure (a round swelling) joining the two horns. 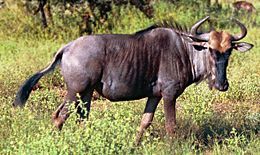 The blue wildebeest is found in southern Kenya, Tanzania, and Zambia, south to Angola, Namibia, Botswana, and northeastern South Africa; it is extinct in Malawi (Taylor 2004). The Serengeti boasts over one million blue wildebeests, but Southern Africa's large herds have diminished over the last several centuries under pressure from hunting, cattle ranching, and habitat intrusion stemming from overpopulation of humans. Estes, R. 1991. The Behavior Guide to African Mammals: Including Hoofed Mammals, Carnivores, Primates. Berkeley: University of California Press. ISBN 0520058313. Huffman, B. 2007. What is an ungulate. Ultimate Ungulate. Retrieved May 18, 2008. Taylor, B. 2004. Bovids II: Hartebeests, wildebeests, gemsboks, oryx, and reedbucks (Hippotraginae). In B. Grzimek et al., Grzimek's Animal Life Encyclopedia, 2nd edition. Detroit, MI: Thomson/Gale. ISBN 0787657921. This page was last modified on 7 November 2011, at 16:52.